The station car park now occupies the site of Brighton Locomotive Works, which were constructed to the east of the main line as it leaves Brighton Station. Established in 1846, locomotive construction did not commence until 1852 and over the next 50 years the works expanded to cover the area as far as New England Road. To make even more space, an extension was built over the track to the goods yard. This extension was supported on brick piers. A few of these survive and can be seen behind Brewers decorators shop in New England Street. With the formation of the Southern Railway in 1923, the works declined, but with the advent of war in 1939 they were re-equipped and locomotive construction recommenced in 1942. During the early fifties one of the highlights for a schoolboy was the annual open day. The last new locomotive was turned out on 20th March 1957 and the works closed completely in 1958. For a short time part of the works were used to assemble Isetta bubble cars which had a BMW 250cc motor cycle engine and were much more stylish than their Messerschmitt competitor. 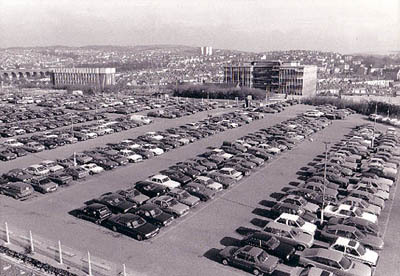 Demolition took place in 1969 and the car park opened in 1972. A few ancillary buildings remain. Martha’s Barn, the furniture warehouse, was the canteen, and an ivy covered building between the two bridges in New England Road was an entrance and clocking-on point. A slight correction… the Isetta Bubble car was powered by a 300cc engine which was not designed to fit a motorcycle. I owned one back in the 70`s, and I`ve been a motorcyclist since 1970.